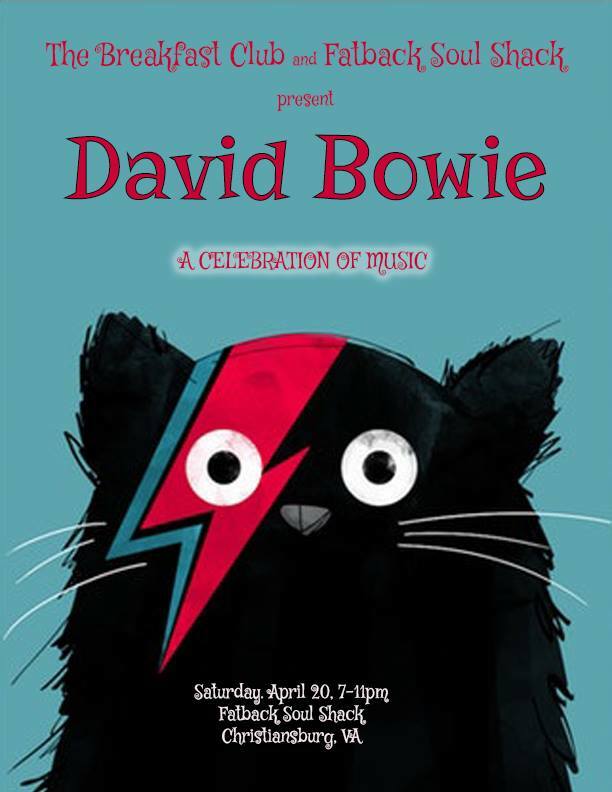 Fatback Soul Shack presents Soul'd Out Saturday with The Breakfast Club's Tribute to David Bowie on Saturday, April 20, 2019. Enjoy a celebration of music featuring the songs of David Bowie. The Breakfast Club started in 2015 and features a group of Blacksburg area musicians that performs rock shows dedicated to a single artist or band. Their concerts are centered around a live performance of an entire album. Current members include multi-instrumentalist John Hildreth, Ezra Ford from Badunkafunk and Stephanie Miller from The Seismix, Erin Lawson, F.M. Turner and David Badger from The Guilty Pleasures. To date, the band has done shows for Wilco, Fiona Apple, Fleetwood Mac, Prince, Frank Zappa and Dirty Dancing Live. In addition to club shows, the band is available for house concerts, festivals and parties, Their appearances at the London Underground Pub Wake-Up Call in Blacksburg are special occasions for the community at large. To view the event flyer, visit: https://i.imgur.com/AACPvEi.jpg.